Rubis is huge compared to KK. The FY 2017-18 Net Profit was Euro 129mn which is about 45% of what KK is valued at 23/-. A serious bunch given they already have bought 25% of KK. ERC, CMA and all those other characters should allow this deal to close soon so they can Show me the Money! I got on this bus when it was around 8/= and I'm not in a hurry to sell even if the buyout doesnt go through. I have been in KK at various prices but I am "in the money" by a decent margin at 23/-. I want it to close ASAP given we might not be eligible for the FY18 dividend. I re-looked at Unga, KenRe and I&M... and these firms are also solid despite the challenges each of them faces. At my age, I rather sleep at night when the kelele ya chura doesn't bother me! KK is buying 33 stations from Delta Uganda & Rwanda. 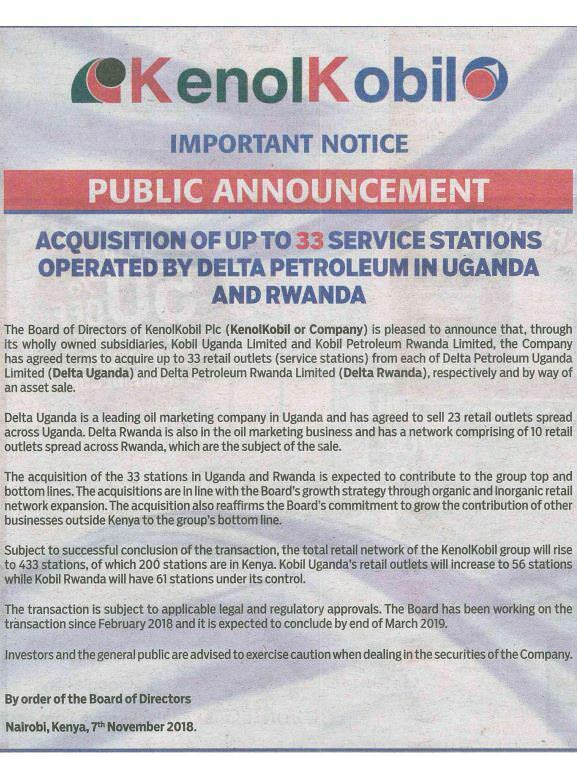 KenolKobil has announced acquisition of up to 33 service stations operated by Delta Petroleum in Uganda and Rwanda. The service stations will be acquired its wholly owned subsidiaries Kobil Uganda Ltd and Kobil Petroleum Rwanda Ltd by way of an asset sale, the oil company said in a public notice. “Delta Uganda is a leading oil marketing company in Uganda and it has agreed to sell 23 retail outlets spread across Uganda. Delta Rwanda is also in the oil marketing business and has a network comprising of 10 outlets spread across Rwanda, which are the subject of the sale,” the public announcement added. KenolKobil said the acquisition of the 33 stations in Uganda and Rwanda is expected to contribute to its top and bottom lines, noting they are in line with the Board’s great strategy through organic and inorganic retail network expansion. KK is the buyer. This deal doesn't significantly affect the valuation in the short-term. Let's assume KK is paying 1bn for these stations then KK has to borrow 1bn or use its cash in the bank. The "net cash effect" is zero. Unfortunately, any delay in Rubis buying us out is an opportunity cost to us given the low(er) prices of shares of SafCom and Centum. A competing offer would be nice but it is unlikely that Rubis will raise the offer given it has already bought 25% from Wells and secured 10% from Ohana and Tamsin. Questions on the ESOP. It may delay the closing. Kenol Kobil need to work on the outlook of their fuel stations. The 23/- offer, even if it closes in mid-2019, was a pleasant surprise given it was 15 last month + I don't think there's much upside from 23. I am glad Ohana is taking us to Canaan with him. I am like those anxious father(s) waiting to feast on the mahari. We know it is on the way and the caravan is some distance away but we keep pacing about Tuko na njaa! Ohana wasn't the guy selling KK but the biwott family. I wish we had a higher price BUT unlike Unga, I do not feel cheated. The moment Rubis bought 25% of KK from Wells/biwotts, the hope of a counter-bid died. Rubis also got a pledge for an additional 4% from Tasmin [biwott?] so with 29% in the bag, what was Ohana to do but also cash out? Perhaps, we would have been better served if ALL the shares, including the biwotts 29%, were on offer to the highest bidder. The CMA should have considered that before allowing the Block Trade.